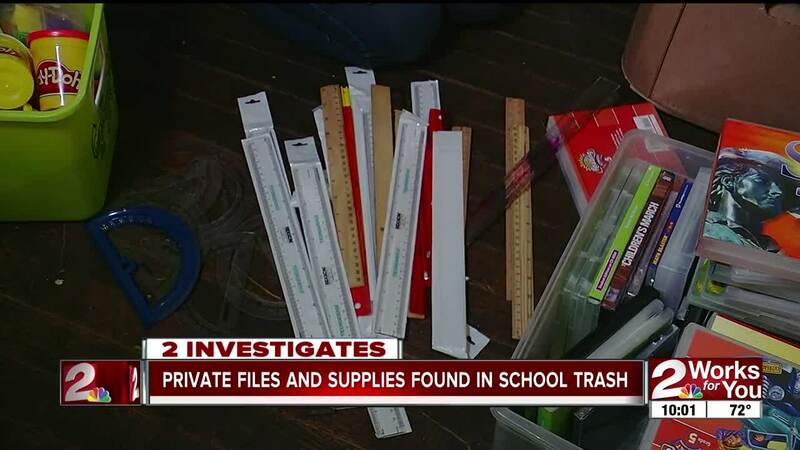 TULSA, Okla. — A north Tulsa mother is concerned after she says she found thousands of dollars of unused school supplies and more than a dozen folders of private information from former students. The district says it’s common to get new curricular materials, but have limited storage to keep old materials. One former McKinley Elementary mother says it’s a shame it’s not put to better use. Kat Knight's living room is filled with watercolors, flashcards, unused lesson plans, play-doh, and rulers. “There’s nothing wrong with it," Knight said. It was all found in dumpsters at McKinley Elementary. “I think they’re doing a great disservice to themselves and a lot of people," Knight said. Knight is homeschooling her 5-year-old daughter this year. The supplies she found is saving her thousands of dollars. Knight also found tests results from former students and personal information — student ID numbers, addresses, and phone numbers. Tulsa Public Schools says it’s protocol to shred private information, but sometimes mistakes happen. They encourage community members to bring those materials back to the district. “I'm not a wasteful person but apparently our school boards and our schools are," Knight said. Knight is now ready to start the year without having to spend a lot of money, but wonders if other parents who homeschool their children need help. “If you’re not going to use it, we will," she said.